Sužinokite apie mus daugiau! Peržiūrėkite mūsų nuotraukas ir vaizdo įrašus. 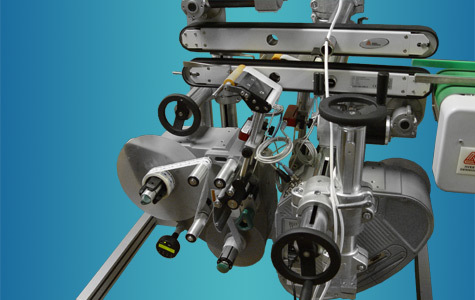 Labelling machines from Novexx Solutions are unsurpassed in quality. The machines are fully equipped with all necessary hardware, such as centering (orienting) devices, conveyors, labellers etc, and software. These labelling machines are used in various industries, including food, pharmaceutical, medical, household products and cosmetics. Our customizable labelling solutions ensure accurate positioning of self-adhesive labels on packaging of different shapes, sizes and materials. We provide both the standard labelling machines and customized ones. Our engineers use their expertise to provide the optimal solutions to the exact specifications of a customer. We render installation and setup services, as well as provide training courses for users and technicians. Below you will find some most common examples (specific applications) of our labelling machines for applying two labels on various products. 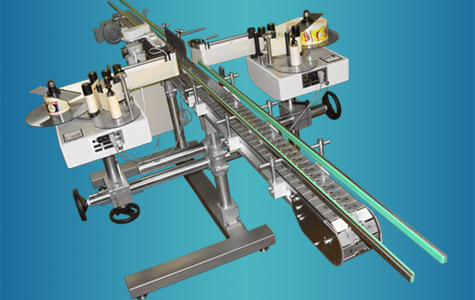 This labelling machine is designed for sticking one self-adhesive (advertizing, security and so on) label to another label and then applying that combined label on the side of a cylindrical product. Comes with two automatic labellers, belt conveyor, and a lateral rotation conveyor with a pressure plate. 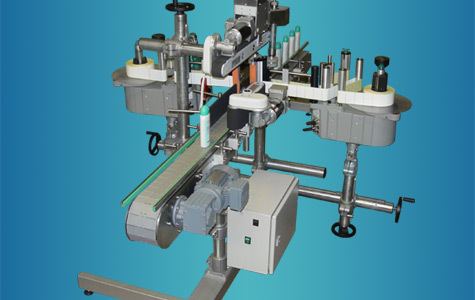 This labelling machine is designed for applying two self-adhesive labels (a label and counter-label) on the side of a cylindrical product, such as a bottle, jar etc. Comes with two automatic labellers, product positioning system (orienting device), chain belt conveyor, and a control box. 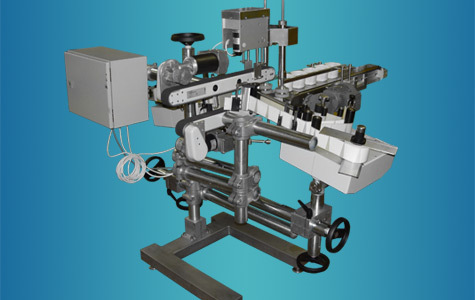 This labelling machine by Novexx Solutions is designed for applying two self-adhesive labels (a label and counter-label) of different sizes on the side of an elliptical product, such as non-cylindrical bottles, jars, cans etc. Comes with two automatic labellers, orienting device, counter-conveyor (upper conveyor), chain belt conveyor, and a control box. 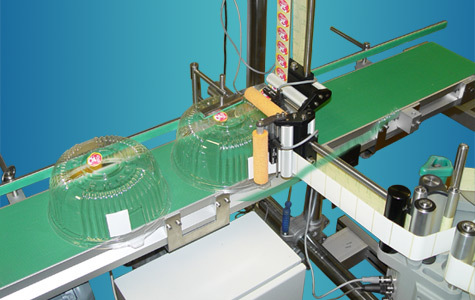 This labelling machine is designed for applying two self-adhesive labels (a label and counter-label) on the side of a conic container (carton). There is an option to equip the machine with two different applicators, if a label and counter-label are of different heights. Comes with two automatic labellers, main feeding conveyor, orienting device, dividing and fixing device, and a control box. 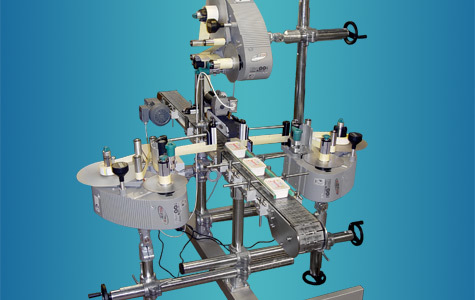 This labelling machine is designed for applying two self-adhesive labels on the top and the side of a box. Comes with two automatic labellers, belt conveyor, and a control box. There is an option to turn a box at 90 degrees in order to print data on the side. 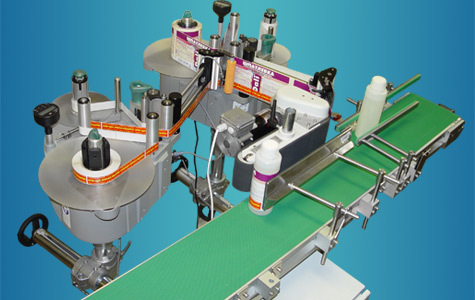 This labelling machine is designed for applying two self-adhesive labels on the top and the side of a product. Comes with two automatic labellers, belt conveyor, smoother (a device for taking the pleats out of a label), and a control box. This labelling machine by Novexx Solutions is designed for applying self-adhesive labels on two sides of a product. And also applies a self-adhesive label at the top lid of a moving product. Comes with three automatic labellers, counter-conveyor (upper conveyor) and main conveyor. 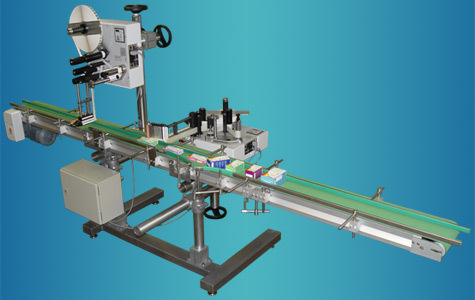 This labelling machine is designed for applying two self-adhesive labels, followed by their L-shape pressing (a tamper-evident function), on the bottom of a rectangular product. Comes with two automatic labellers, two counter-conveyors, feeding belt conveyor, L-shaped pressing device, and a control box. 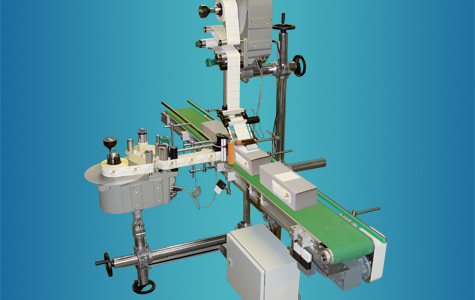 This labelling machine with a feature of 90-degree product rotation is designed for applying two self-adhesive labels on two adjoining sides of corrugated boxes. One of the labels sticks to the side of a box, another one to its top. There is an option of printing data on the side of a box by an inkjet printer. Comes with two automatic labellers, swing assembly for turning a box at 90 degrees in order to print data on the side of a box by an inkjet printer, belt conveyor and a control box. (Optional: Hitachi industrial inkjet printer, and print head adjustable mounting hardware for a conveyor). SIA „Forintek-Baltija“ siūlo moderniausią įvairių gaminių kodavimo ir žymėjimo įrangą. Naudojant mūsų siūlomus pramoninius rašalinius kodavimo įrenginius, terminius perkėlimo spausdintuvus ir etikečių žymėjimo sistemas, galima gaminti aukštos kokybės žymėjimo etiketes ant beveik visų rūšių medžiagų ar paviršių, pavyzdžiui, galiojimo datos etiketes, brūkšninius kodus, partijos kodus ir t.t. Užpildykite toliau pateiktą trumpą formą ir mes netrukus su Jumis susisieksime bei aptarsime Jūsų pageidavimus. © 2019 SIA „Forintek-Baltija“. Visos teisės saugomos.